In my previous post, I focused on capturing, tracking and disclosing information about the licences that apply to packages of data within the Linked Archives Hub dataset. Towards the end of that post, I introduced the notion that licence data was just one part of a broader set of metadata that we should capture and make available. As discussed in that post, the Linked Archives Hub dataset, like the Archives Hub EAD dataset from which it is derived, is an aggregation composed of data contributed from multiple sources. The EAD data contributed to the Hub is all created by cataloguers from the contributor archives, professionals working directly with the materials they are describing, which provides assurances about the nature, quality and accuracy of the information provided in the data. For Linking Lives, the ideas is to bringing data from the Linked Archives Hub dataset together with data from further, possibly more diverse sources. Some of these sources are created by other information professionals; others such as DBpedia may be the result of work by a broader community; others may be the product of algorithmic processes. In this context, I think, it will be important to be able to indicate clearly which data comes from which source, when it was drawn from that source, who is responsible for the source (assuming that information is available), any processes which have been applied to it, and so on. Providing this information enables a user of the data to make judgements about the quality and currency of the data. It may well be important for providers, too: links back to original sources may be a “route in” to other resources they offer, and the simple presence of attribution may be important to them, both in terms of disseminating their “brand” and in providing evidence for the use of the data they provide. For the project too, and for Mimas as providers of the Archives Hub service, I think we need to improve our management of this sort of data (as “administrative metadata”, if you like). While our processes aren’t currently very complex, we do need to be better at tracking when data was “ingested”, which versions of which processes were applied at what point in time, and so on. Potentially there is quite a lot of information which might be provided in this area, so as Jane discusses, its presentation will need some careful design. We may wish to build features into the interface features which allow a viewer to “drop out”/”add back in” chunks of data based on their assessment of such metadata. Consider this example from Sig.ma, an application which Jane also mentions in her post. Sig.ma is a viewer application for Sindice, an RDF aggregator which crawls RDF data sources on the Web, aggregates the data it finds and provides various search/display/analysis services over the aggregated data. The left hand column shows a summary view of the triples that Sindice has cached with (I think) this URI as subject or object. The right-hand column lists the sources from which those triples were obtained. (I find it slightly confusing that in this case the right-hand column shows the “thing URI” rather than the “document URI”). There are options to switch the data sources in and out, so that the triples from that source in the left-hand column will disappear/reappear. The metadata about the sources presented here is fairly minimal: for each source, there’s an indication of the number of triples from that source, and a date, which I imagine is the date they were harvested. But in principle, one could envisage that extended to display a fuller set of “provenance metadata” for each data source. The Sig.ma view is something of a “raw” “under the bonnet” (“hood”, for our American readers) view: I’m presenting it here to try to illustrate the general point about tracking the sources of chunks of data and displaying that information; I’m not suggesting that Linking Lives would adopt this same style of presentation. The other point, as Jane notes in her post, is that Sig.ma surfaces any/all data it crawls: its “selection criteria” are very broad, if you like. We haven’t yet made any final decisions on an “architecture” for Linking Lives, but one of the key choices we need to make is whether the user-facing application draws data from the Linked Archives Hub and from other sources “on the fly”/”on demand”, or whether we periodically harvest and store/cache data from other sources and then the user-facing app runs from that stored data. It may be that some hybrid of the two approaches is appropriate, but I suspect that for reasons of performance and reliability some element of harvesting and storing will be required. And that process of aggregation may go beyond simply collecting and merging data from distributed sources. We might perform some simple inferencing to generate some additional triples to simplify querying. That might be the simple “materialization” of triples based on RDF Schema/OWL semantics, or it might be some more complex rules-based processing, say, to expand a simple statement of a life date into the sort of event-centric form I described here. And (again returning to one of Jane’s points), there is a process of selection involved – choosing particular data sources, and perhaps choosing particular subsets of data from within those sources – and it can be argued that that that selection in itself – if performed effectively! – may be a source of “added value”. I think sometimes when we’re discussing “aggregations” there’s a tendency to think in terms of “aggregations” as quite large-scale, “formal” collections, scoped by “domain” or “community” boundaries. But it seems to me we form aggregations like this all the time, typically pulling together specific subsets of data to address specific requirements of some particular application, where the scope is determine by the “functions” of that particular application. In the discussion above, I considered the provenance issue mainly from the perspective of presenting information to a human reader. 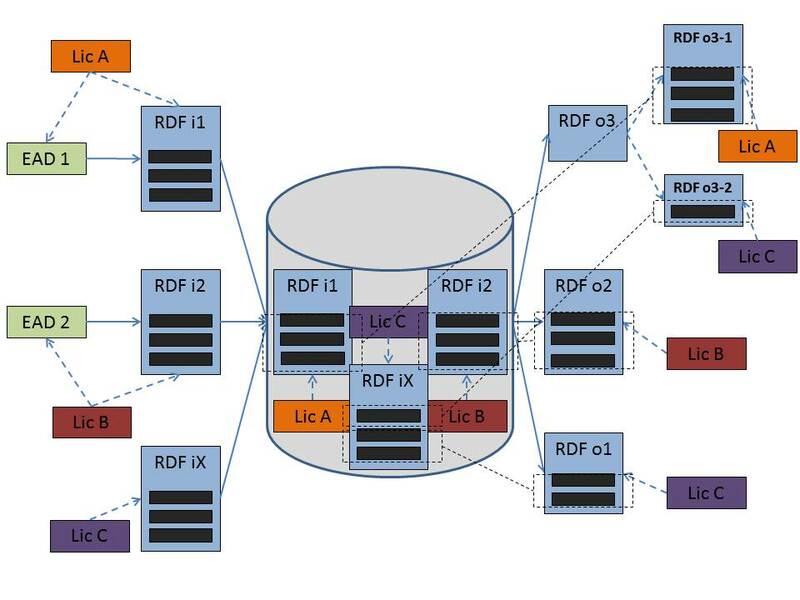 But in principle at least, the data presented in human-readable form by Linking Lives could also be re-exposed as new graphs, new packages of RDF data, available via content negotiation. I think this is one of the characteristics that lead Kingsley Idehen to label this sort of application as “meshups”, to distinguish them from the traditional “mashups”. 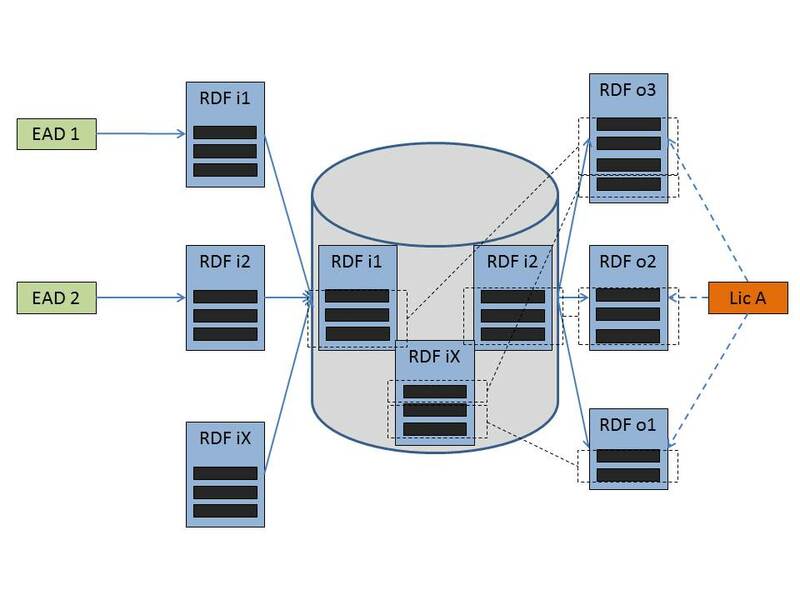 With these two factors (aggregating data from different sources into a store, and (re)exposing data as RDF) in mind, I think it becomes easier to see some similarities between this and the architectures I sketched for the Linked Archives Hub in the previous post. In the diagrams in that post, I had the RDF graphs derived from EAD documents as the inputs on the left hand side, and the Linked Archives Hub “bounded description” pages as outputs on the left. For Linking Lives, we would have data from the Linked Archives Hub (either the individual pages or some other subsets generated by SPARQL queries) and similar from the other sources, as the inputs on the left and the Linking Lives “views” on that data on the right. 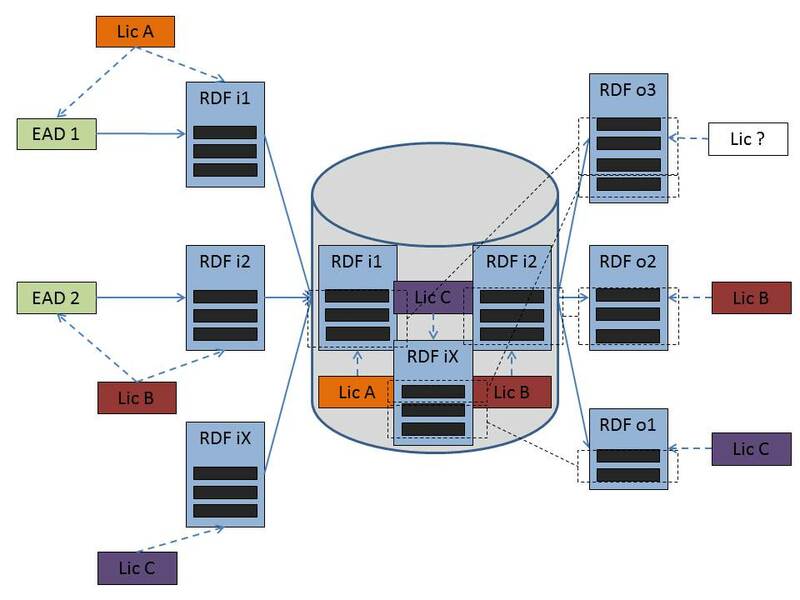 In the Linked Archives Hub case, the “container” for our aggregation was a single triple store; for Linking Lives, it may be something similar or it may be more of a “hybrid” of data stored centrally and data retrieved in real time. But logically, I think the picture is probably very similar. In the previous post I focused on metadata about licensing associated with each source; but as I acknowledged towards the end of that post, licence metadata would be part of a broader set of provenance metadata associated with each source. I’ve tried to reflect this in a modified version of the diagrams from the previous post. I reduced the number of sources to two, to try to reduce the number of criss-crossing lines, but it is still rather messy! My point is really to try to illustrate the broad similarity of the two scenarios. I added the pale green boxes to represent the human-readable HTML output pages – analogous pages are present for the Linked Archives Hub case too, but for simplicity I omitted them in the diagrams in the previous post. I’ve tried to indicate the relationship between the metadata “about” the output graphs and that “about” the input graphs. We’ll need to be careful with issues of identity here, I think – when are we talking about the same graph and when are we talking about distinct graphs, one derived from the other. Bearing in mind what I said above about the “architecture” still being a work-in-progress, what is represented above as a single “store” may in practice turn out to be several distinct components. I think one of our next tasks should be to focus in on some scenarios/use cases to distill out some requirements for provenance metadata, and give ourselves a clearer idea of what metadata we need to collect or generate. One of the aims of the Linking Lives project is to demonstrate the value of Linked Data through the creation of an end-user interface that pulls in content from the Hub Linked Data, including the external data sets we are linking to. The Linking Lives interface will be part of the Archives Hub service, that is to say, available from within the Hub website. We will present it as a beta service; something that is usable and useful, but also in a state of development. With the provision of this interface, we can start to build up an understanding of how valuable this type of name-based resource is for researchers. We will be able to monitor use as well as carrying out an evaluation to ask researchers what they think of the site. This is far preferable to positing benefits based upon potential, which is tending to happen too much with Linked Data at present. This post is written from a non-technical perspective and covers a few of the areas that we are currently thinking about, as we start to set out our interface design. We will be concentrating on development of the interface, rather than prioritising scale for this project: quality rather than quantity you might say, although we expect to have some thousands of records included. This is partly pragmatic, because we are still finding challenges over integrating EAD data (Archives Hub descriptions) into our Linked Data because of inconsistencies and sometimes problematic content. The problems that we face with variable data are ongoing, and maybe highlight a basic issue with Linked Data: it works best with consistent data-centric information, and not so well with archival descriptions, built up over decades, many created before there were any standards at all to adhere to. However, on the positive side, our Linked Data work has enabled us to highlight and deal with many data issues, which is beneficial in the long run for any data processing that we might do (or that others might do). Our focus for this project is on the Linking Lives pages themselves, and what researchers can access from there, so we will not be prioritising the creation of different search options into the data: this would be a next stage, once we get a clearer idea of the use of the interface. We want Linking Lives (LL) to be recognisably part of the Hub, although it would be premature to try to fully integrate the two. As yet, we don’t know how users will respond to what we are proposing, and we need to evaluate what we are doing before taking it further into service. We are carrying out an evaluation as part of the project: we will be asking a small group of researchers questions about the current Hub interface, and following this up with some focus group work to get reactions to our new LL interface. This will help us in understanding user requirements. Linking Lives will be an interface available within the Archives Hub site, but we propose to incorporate data other than archival descriptions within the page. This does raise questions about the clarity of what we are doing and the balance between the different data sources. If we strongly brand the page as Archives Hub, will researchers expect to access just archives, and not other information resources? Will they assume all of the sources are held by us, or that we are responsible for them? If we include the basic Hub navigation at the top of the page, will that actually confuse users, as they may click on links that take them into the main Hub search without realising that LL and the Hub are somewhat different? We are looking at creating a sub-brand of the Hub as a possible way to identify LL as part of the Hub, but still distinct from it to some extent. This may help to distinguish between the two different applications. We will use the basic Hub logo, but modify it to signify something different. We do want to keep the links between the two, as we believe that researchers will benefit from this, and we do want to bring archives and other data sources together to provide a fuller context, and not make them too distinctly separate. The idea is to enable researchers to move seamlessly from archives described within the Hub to other resources, and take a fairly bold approach to integration, otherwise we will not get the benefits we are after. I am somewhat reminded of The National Archives’ initiative called ‘Your Archives‘, which is a Wiki for community content that it does seem to have remained rather separate from the main TNA catalogues, and maybe that has been to its detriment in terms of profile and use (I often have trouble finding links to Your Archives from within TNA’s website). 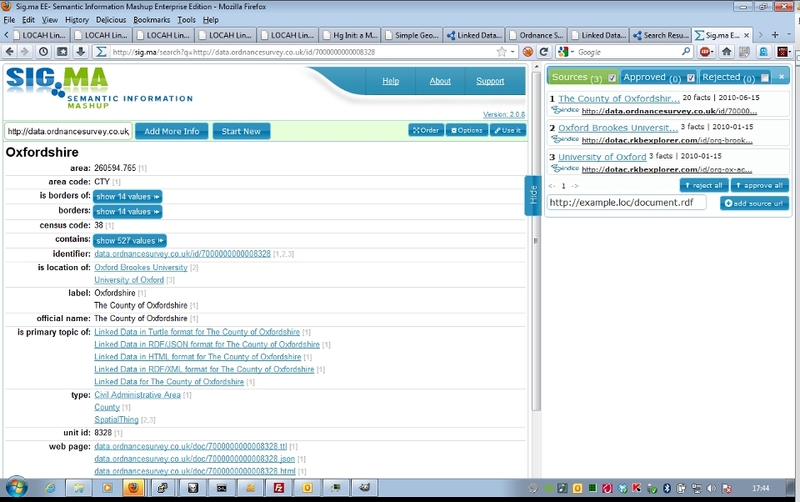 The LL interface, like the Hub itself, will not be aimed at subject specialists or expert users. It will primarily be aimed at academic researchers, but is intended to appeal to a broad audience: anyone who might be interested in undertaking research. This means that we need to avoid making assumptions about knowledge. Our ‘designated community’ may not have prior knowledge of archives and certainly won’t have knowledge of Linked Data. So they may not know how archives are organised, what an archival ‘biographical history’ is, what an archival creator is, or what ‘same as’ links are between different data sources. Our aim, therefore, is to incorporate these things in a way that makes sense and makes the person the primary focus of the page, so that it is easy to see that a page is about George Bernard Shaw, for example, and it provides life dates, descriptive information, biographical information, an image or two, aliases for the same person, etc. It is information you might expect to find, or information that makes sense within the context of a page about a person. At the same time we are keen to ensure that we capture provenance, and so this adds another dimension. Starting to include the source of each piece of information could clutter the screen and so we will need to think about how best to incorporate it. We believe that it will be important to some users, as it could have implications for the quality and accuracy of the data. It is something we would be pleased to see others do for our data, if they were presenting it in a Web interface. Our interface will combine content from different sources. We would like to draw in content, in a similar way to the BBC (on the BBC page for Stevie Wonder you can see how the Wikipedia biography is pulled into the page). The BBC page pulls in some of the Wikipedia biog, and provides a link to to go Wikipedia and read more. This helps to make clear that the information comes from elsewhere. With MusicBrainz, another Linked Data source, the BBC provide a link to the MusicBrainz site, but also, further down their page, they state: “Links & information come from MusicBrainz. You can add or edit information about Stevie Wonder at musicbrainz.org.” The information includes personal and business relationships, such as ‘child of’ and ‘collaborated on’. On the BBC page, the Wikipedia information is more clearly labelled as being from that source; the MusicBrainz information is also identified, but in a less obvious way. But for this, they are not only declaring where the information comes from, they also also invite people to edit the information themselves. LL will be a useful resource in itself, but can also be a starting point, in much the same way as the BBC provides a page that gives substantial information on a musician or an animal they are interested in, but also invites people to move away from the site to other resources. This in itself is an interesting shift of focus. Long gone are the days when some sites actually disabled the ‘back’ button, and now we are moving towards an even more fluid world, if this type of approach continues to gain traction, where we are not always trying to keep people on our pages, but are actually encouraging them to move around the ‘Web of Data’. Looking at the BBC page on Stevie Wonder again, one thing that I notice is that it is quite busy. There is a good deal of information, with various boxes and loads of links and options for the user. There does seem to be a trend towards busier pages now, maybe an indication that people are increasingly adept at finding their way through information online, so a certain level of complexity is acceptable. Also, the page is quite long. The BBC page about mammals is similarly long and complex: introduction, links to other pages on mammals, distribution, classification, BBC news, video, information elsewhere, size ranges, the Wikipedia ‘about’ page, etc. Yet the page does not seem cluttered or difficult to navigate. This is partly because of use of plain language, as well as BBC expertise in web design. It may also be that expectations largely match reality: users may expect the BBC to provide a wealth of information, and they generally know what they will get if they go to ‘programmes’ or ‘video’ or ‘news’ pages. Expectations do play an important part in good Web design, and maybe it is easier if you are a very well known provider, as the expectations people have are clearer? Many people come into a page through a search engine, so you cannot expect they will have used your homepage, and picked up information via this route. However they arrive at a BBC page, most people know what the BBC is. But arriving at an Archives Hub Linking Lives page, you probably have little idea of the provider in this case, and you may not be clear about what archives are in this context. We chose to create a biographical resource partly because this would provide a focus; we can convey the fact that the page is about one person relatively easily. This makes it easier in some ways that working the Archives Hub itself, which doesn’t have that kind of focus. If we provide a page with a whole range of links to various types of biographical content, then we should be able to convey what the page is about fairly easily. It may be that good clear and simple headings and relevant content (about one subject – in this case one person) is better than providing explanations about what you are and what you are trying to provide, as people don’t tend to read help pages. Our interface will use the external data sources within our data, and will be designed in order to give users a controlled experience, in the sense that we are evaluating the sources we include and presenting the interface in a very defined way. Of course, we cannot control the content of the external data; I am just talking about the way we present it. An alternative approach would be to pull in all the data that can be found on a topic and display it. Maybe this is the ideal for Linked Data – the ability to bring in any data sources on a topic – but we are quite some way, it seems, from presenting this in a way that end users will want to use. Try a search on Hakia, a semantic search engine (not directly about consuming Linked Data, but about pulling in related information in a more semantic way). I looked for Beatrice Webb, and got a substantial amount of information from a very diverse range of sources, including news, blogs, twitter, images and video. It’s quite impressive in principle, and could be really useful for a researcher, but the net is cast very wide, so it’s not easy to process all of this varied information. Sig.ma describes itself as a semantic information mash-up. If you take a look at the page that sig.ma provides for Beatrice Webb, a substantial amount of data is pulled in, but it is not very user-friendly, not always very coherent and sometimes not relevant. Obviously it is just a demonstrator, and I would say it is for a different audience, with more expertise in Linked Data. It does show the potential for this type of approach, that draws in a really diverse range of data on on-the-fly, but it also shows how semantic searching is complex and difficult to achieve within a user-friendly interface. Sites like Wikipedia have biographical pages, and we can never compete with them, so what can we offer that is of value? Essentially, our focus is on meeting the needs of those who want to carry out more in-depth research and who are likely to use primary sources. It may not be people who know they want to use primary sources, it may actually be a means to bring people to archives for the first time (we know that a large proportion of Archives Hub users are first time users of the Hub, and have not necessarily used archives before). We want to make primary sources the focus, but at the same time put them within the context of a whole range of information sources about a person, so that they are not held apart as somehow different and not for mainstream researchers. 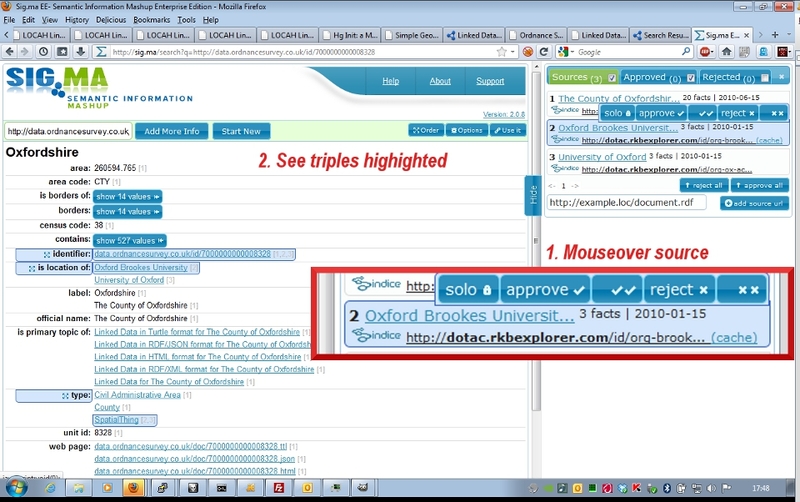 It is also worth pointing out that our interface will still in some sense be a demonstrator – it will provide one option for presenting our Linked Data, but the data is there for others to create their own interfaces, and the Sparql endpoint is there for people to query the data in the ways they want to. In addition, we can re-expose the data that we present. So, there are several purposes here: benefiting end-users, evaluating a name-based approach and putting archives within a broader context, demonstrating the sort of interface that can be provided from Linked Data and possibly re-exposing the data to create more potential benefit. As a follow-up to Jane’s post on licensing, I thought I’d write up a few notes looking at some of the practical challenges of managing the Hub linked data and the licence(s) that apply to it. I’m not an expert in rights/licensing at all, so here I’m mostly thinking about the “mechanics” of “labelling” “packages” of data with appropriate licences (as part of other metadata that might be applied to those packages) at various points in the system. The thoughts here are prompted mostly by my thinking about the current LOCAH system rather than anything more specific to the “Linking Lives” project. I should try to write more about that in a follow-up post, but I think many of the underlying issues are common to both contexts. Figure 1 represents the current situation, with data flowing (roughly) from left to right. The “input packages” here are EAD XML documents (e.g. EAD 1 and EAD 2 in the diagram), provided by multiple archives (contributors to the Archives Hub “aggregation”, to use the teminology of the UK Discovery initiative). These are converted to RDF/XML documents on a one-to-one basis i.e. 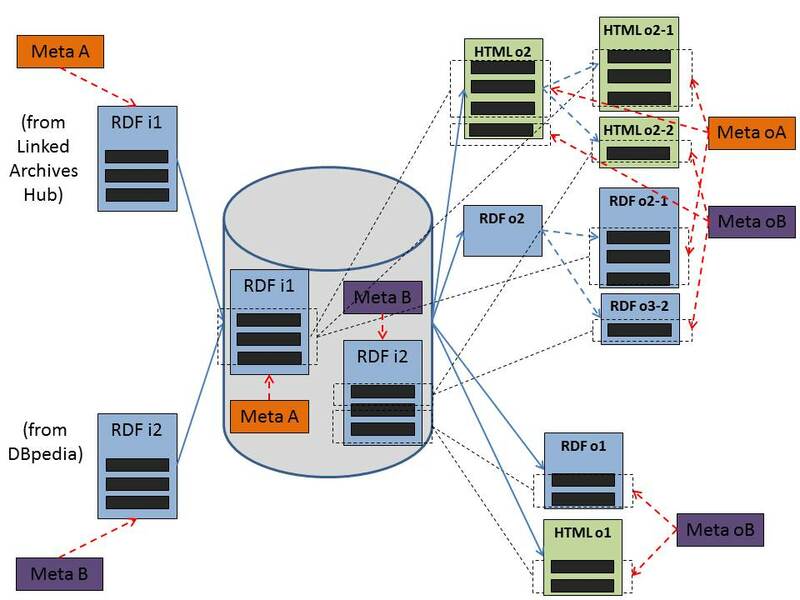 each EAD XML document is transformed into a single RDF/XML document, a serialisation of a single RDF graph, a set of RDF triples (Graphs i1 and i2 in the diagram). Triples are the “atomic units” of our data, with each triple expressing some simple assertion of a relationship between two things. Some further RDF data not derived directly from the EAD data (Graph iX) is also uploaded to the triple store. Currently this includes data about repository postcodes, links to external resources generated through a post-conversion process, and data about the dataset itself. As these have different sources and characteristics, it would be more appropriate to represent several different graphs here, but again for simplicity, let’s assume we just have the one “package” to deal with. This merged data is then exposed as Linked Data, in the form of a second set of graphs (Graphs o1, o2 and o3 on the right of the diagram). These are “bounded descriptions” of single resources. i.e. packages of data “about” that single resource generated by querying the triple store. Roughly, they are sets of triples with the URI of a single resource as subject or object (For a more formal discussion, see e.g. “Bounded Descriptions”). Again, they are made available in multiple formats, but, again, let’s leave that to one side here. Currently, that “expose” process applies the same licence to each of those output graphs, and a triple stating the relationship between graph/document and licence is included in the output graphs i.e. it forms part of the graph-/document-level metadata provided on output – the graph is “labelled” with that licence, if you like. One of the points to note here is that there is no simple correspondence between the content of those input graphs on the left and the bounded description output graphs on the right: for a single output graph, the triples within it may have originated from a single input graph or in multiple input graphs. I’ve tried to highlight this with the dashed boxes and arrows overlaid in Figure 2. Output graph o1 (lower right) contains a subset of the triples from input graph iX, output graph o2 (centre right) contains the same triples as input graph i2, and output graph o3 (upper right) contains triples from both graph i1 and graph iX. A description of an “archival resource”, like that of the Beverley Skinner Collection: in this case the data is all (I think) from the single input graph derived from the corresponding EAD document. A description of a “concept” the name of which has been used as an index term, like that of the concept of “Economic history” from the UNESCO Thesaurus: here, the data includes links from two different archival resources, one held by the British Library of Political and Economic Science and one held by Glasgow University Archives. Those links have their origin in two different input graphs, derived from two different EAD documents, created and contributed to the Hub by two different institutions. So there is a process of “decomposition”/”recomposition” or “unpackaging” and “repackaging” taking place here. On upload to the triple store, the input graph/”package” is decomposed into its constituent atomic triples/assertions; the process of exposing Linked Data recomposes subsets of those triples into a new set of output graphs/”packages”. I think this is a characteristic of many (most?) applications based on aggregating data from multiple sources, though the degree of decomposition/recomposition may vary. However, I think it may be a characteristic that is perhaps unfamiliar/unusual from the “traditional”, “document-centric” perspective of archival description. From that perspective, an archival finding aid is typically seen as something created, distributed, and “used” or “consumed” as a single document – the finding aid document is the “package”. Yes, there are identifiable individual component “descriptions” within that document, but they are typically “read”/interpreted within the context of that whole. The design of the EAD XML format, I think, largely reflects that, though of course applications based on EAD often do extract, index, and (re-)present components in new combinations. In the current LOCAH system, the triple store is essentially a “big pot of triples”: it does not record the information that a particular set of triples had their origin in a particular input graph. At the moment, if we needed that information when generating the output graphs, I think we’d probably be relying on some rather ad hoc heuristics to try to reconstruct it, e.g. And so on. But even with some inventive rules, I’m not completely sure we could account for all triples in this way. Now, let’s return to the particular question of licensing. Consider a new scenario in which the different EAD input documents are subject to different licence terms, with the expectation that this is “reflected in” the Linked Data outputs. I wonder whether, in practice, this “reflection” may not be quite as simple as “output licence” = “input licence”, but for simplicity (again :)) in this discussion, let’s assume it is. The cases of output graphs o1 and o2 are relatively straightforward as in each case there is only a single input graph to consider in determining the output licence. But with graph o3, there are two inputs to consider, each with different licences. Output a single document/graph labelled (as above) with a licence (or licences?) that somehow accommodates/encompasses the requirements of both the input licences. This is illustrated in Figure 4 below. Whether this is possible depends on the characteristics of the licences: it may be that they are sufficiently different that this condition can not be satisfied. 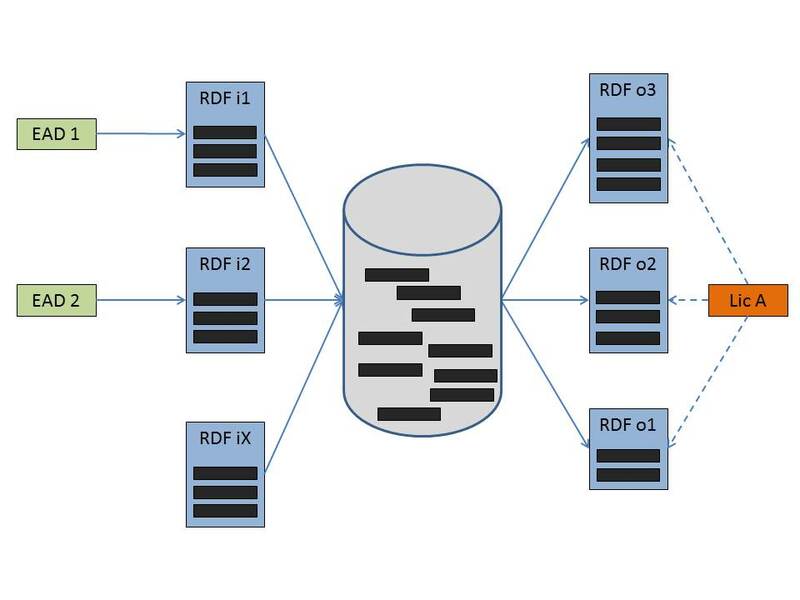 A third option woud be to output a single document which labels subsets of the triples with different licences as appropriate, either using reification or by making use of an RDF format that supports multiple graphs per document – sort of the equivalent of labelling different blocks of text on a human-readable page with different licence information, rather than labelling the whole document. This would be a break from the graph-document equivalaence which I posited above, though. I should hold my hands up at this point and admit that I haven’t tried to implement these options above, but while they certainly add an element of complexity, it does seem that the second or third could be managed. In addition to generating a set of individual bounded descriptions, we also make available a complete dump of the dataset i.e. all the triples in a single graph – and currently subject to a single licence. The “multiple licences” challenge could be managed in a similar way to the second and third options for above, i.e. partitioning the data, either into multiple physical dumps or into subgraphs within a single dump, and associating each with a different licence. We propose to make provenance metadata a part of the dataset published via such a SPARQL endpoint so that queries can ask for provenance information. Furthermore, a provenance-enhanced SPARQL query engine could also add provenance metadata automatically to query results. Although I’ve discussed this in the context of an application that generates Linked Data, many of the underlying issues are not specific to that context, and it can be seen as a particular example of the sort of issues that arise when combining resources which are individually subject to different licences. (See, for example, some of the discussions around open licensing for educational resources.) Having said that, as I noted above, I think the data case makes this more apparent because the nature of data (re)use almost always introduces a high element of “recombination”. Tracking the sources of triples and characteristics of those sources may be important/necessary for reasons other than licensing. For example, even in a case where all the source data is covered by a single “open” licence, it may be useful for any output to disclose information about the data sources from which it was created, and any processes applied to it, so that consumers of the output data can make assessments about its quality (currency, accuracy etc). This is the focus of the work by Hartig and Zhao I noted above. And indeed I was reminded by a recent thread on the W3C public-lod list that it may be considered good practice to explicitly partition up a dataset along these lines so that consumers can clearly understand – and applications can work with – the different characteristics of different subsets of the data. It seems to me that one of the primary motivations for creating “aggregations” like the Archives Hub is the notion that “the whole is more than the sum of the parts”, that there is “value added” in bringing distributed data together – logically or physically – and enabling operations of various forms across that aggregated data. Such operations almost inevitably involve some form of complex recombination of components of the input data. So for that value to be fully realised, first, the data must be available on terms which permit those sort of operations, and, second, we must be able to ensure that the terms of such licences are reflected appropriately in the outputs of those operations. I have been starting to think about the user interface for Linking Lives. We will probably go for something quite simple in terms of layout, because there is quite a bit of complexity when bringing together a range of data sources. It may be thought that integrating the external data sources is the challenge, but I think that it is probably more of a challenge to integrate several archival descriptions into one biographical record and also to convey the context of the archival descriptions clearly. In general, it is considered good practice for the biographical history to be appropriate to the records being described. So, you don’t include a full life story when you are describing one letter relating largely to one event in a person’s life…. …but this guidance is not always adhered to, so some biogs are long and detailed for a small and discreet collection, others are very brief, even though they may relate to an archive that spans the individual’s entire life. Some repositories will use largely, or entirely, the same biog for different collections about one individual, others will create very distinct biogs, and some may use biogs that have been created by other institutions. Some biogs will involve a significant amount of research, with the archivist drawing on the unique sources they are cataloguing to provide information that may then be quite unique in itself, making this field particularly useful for researchers. I am going to use the example of Martha Beatrice Webb here, a significant figure in history, and one with plenty of archival sources that relate to her. Beatrice Webb (1858-1943), nee Potter, social reformer and diarist. Married to Sidney Webb, pioneers of social science. She was involved in many spheres of political and social activity including the Labour Party, Fabianism, social observation, investigations into poverty, development of socialism, the foundation of the National Health Service and post war welfare state, the London School of Economics, and the New Statesman. 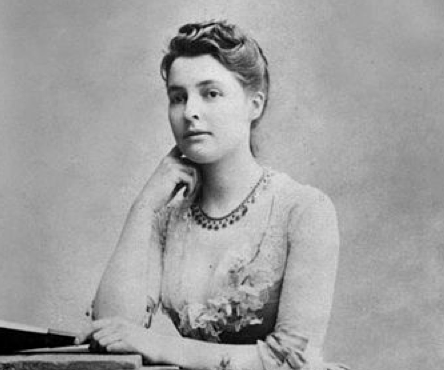 Beatrice Webb (1858 – 1943). Fabian Socialist, social reformer, writer, historian, diarist. Wife, collaborator and assistant of Sidney Webb, later Lord Passfield. Together they contributed to the radical ideology first of the Liberal Party and later of the Labour Party. The role of the Reconstruction Committee involved ‘…surveying and unravelling the whole tangle of governmental activities’ introduced during World War I (1914 – 1918). It was established in early 1917 but by July 1918 had been disbanded, Webb reporting that its ‘…machinery was too rickety to survive’. For researchers, the prospect of trawling through 14 biog entries may not seem very enticing. We do have the option to use one as the default display and then provide links to the others, but then which to pick and why? So that leaves us with listing all of the biogs along with the collection titles. Possibly a rather unwieldy answer, but on the other hand, it could be argued that this is an improvement on researchers having to click through 14 separate records. It does at least pull the biographical information together to some extent. In terms of our data modelling, the great thing about Linked Data is that we can decide what to say about entities within the data. For Locah, we have linked bioghist to the agent – so in this case the agent is Beatrice Webb (or Beatrice and Sydney Webb) – and we have also linked it to the ‘Archival Resource’ (the collection itself). We could decide to say that a bioghist is about someone strictly in the context of one archival resource, rather than making a link directly with the agent, but this would probably complicate things too much. The SNAC project in the US (Social Networks in Archival Context) is working on creating archival authority records, which is a little like our project to create biographical records, but they are using a distinctly archival standard, EAC-CPF, and not incorporating external data within the records (though it may be referenced on their interface). Most of the people on their prototype have only created one collection, which makes life easier, but looking at the entry for Ella Fitzgerald, there are two collections. You can see that both biogs are displayed, and the source for each is given. It is interesting to note with this display how the source is given less prominence, being given in smaller letters at the end of the text. Another example, Royal Chicano Air Force, provides two biogs, but they are both the same apart from a small addition to one, even though the collections are held in different institutions. I should emphasise that the SNAC interface is a prototype, and I know they will be doing more work on the display, so I’m not out to be critical (I think its a great initiative). But I do wonder whether it is a good idea to display all the biog entries one after the other with not much emphasis on where they come from and hence why there are several of them, maybe with substantial repetition. If they had an entry for Beatrice Webb with our 14 collection descriptions the biog entries would create one very very long page. I think that we may look at including all of the biog entries, clearly linking them to the collection titles, but possibly only displaying a limited number of words for each, with the option to go to the full entry. That way we can include all of them, give a sense of what each of them provides, and let the user decide where to go from there. Another avenue we would like to explore is extracting concepts from this data, and maybe that would be a way to start to find common concepts within a number of biogs. But we’ll have to see how far we manage to get with that particular challenge. You can read more about it on our ‘About Us’ page. First things first. We currently have a Linked Data store with a small amount of Archives Hub data. We need to expand this considerably. Our aim is to provide a substantial amount of the Hub data, preferably the entire data set, as Linked Data, and then it will be part of the Linking Lives interface. We had already consulted with Hub contributors about our Linked Data work, but in order to really expand the data set, we need to make it very clear to them what we want to do. The Archives Hub is an aggregation of data from over 200 archives across the UK, so we are in a very unique situation, and we want to work with archivists to move the community towards an open data agenda. It is vital for us to show our contributors that we are working on their behalf, and that they will be fully informed about our plans and progress. We feel that it is important to give the data an explicit licence, preferably a completely open licence. That way we don’t put any barriers in the way of its potential reuse. I was recently at the Europeana Tech conference in Vienna, and the dominant theme of the conference was the fundamental importance of open data. One observation that struck me was the conclusion from Europeana participants that it is better to put less data out but put it out under an open licence, than put more data out but compromise with a complex and/or restrictive licence. Some of the Archives Hub contributors have been concerned about commercial exploitation. It is worth looking at Jill Cousins’ presentation on this. She argues that even a non-commercial licence means that you are substantially restricting the potential of the data. It can’t be used on any sites or cultural blogs that demonstrate any commercial activity, it can’t be used with Wikipedia or by commercial companies that might generate income for partners. We need to bring Hub contributors on board with this vision, and to do this we sent out an email to all contributors outlining our proposal and asking that they let us know if the do not want to participate. 3) Referred to the potential for us to be involved with the US-based ‘SNAC‘ project. This is not a Linked Data project, but it is creating name authority files using the archival standard of EAC-CPF, and I wanted to show that we are working on different fronts with the aim of improving access to archives. I do think it’s worth giving this kind of context; showing that services like the Hub are working in different ways on behalf of archives to promote understanding and use of primary source material. 4) Referred to the options for licensing, referring to the possibility of an attribution licence, although ideally we would still opt for a completely open licence and strongly promote best practice around attribution (and we are looking at named graphs with this in mind, as a means to ensure that the provenance of statements can be shown). 5) Emphasised that this is about the metadata, not the content. This may sound obvious, but it is an important distinction. 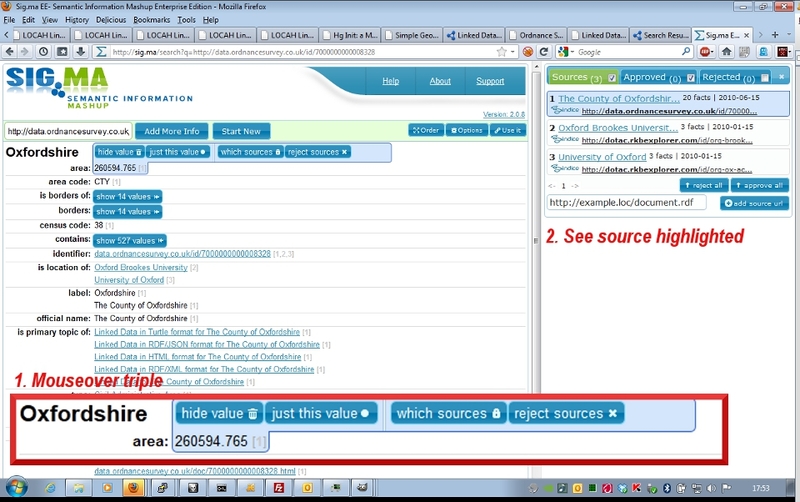 The metadata is there to promote the collections. There are far more complex issues around open access to some collections, where there are legal issues around IPR. 6) Referred to some useful sources to read more about open data and some initiatives, such as Europeana and Discovery, that are fully behind an open data approach. I think the real potential of Linked Data is still difficult for people to grasp. I pointed to things like Tim Sherratt’s recent work, creating a narrative using the Web of Data, as this is a great way to demonstrate the possible uses of this structured data, and I also referred to established and respected institutions like the BBC leading the way with using different data sources and taking the risk of incorporating Wikipedia data on their site. So far we have had two contributors asking to opt out of the Linked Data work, one very small archive and one large HE archive. We have also had some questions about what the work involves, questions that show a certain level of concern (as you would expect), albeit with an overall positive attitude towards open data. Maybe we need more explicit help with licensing archival data. There are a number of useful sources, such as the Licensing Open Data guide (PDF) available from the Discovery website, but it would be useful to have a document that specifically refers to opening up archival metadata, and maybe more information on the issues around data aggregations. Several contributors have written to us to show their support, including the Universities of London, Dundee and Hull. We are very pleased that two of our biggest contributors, the University of Glasgow and John Rylands Library at the University of Manchester, have shown very strong support. We’re going to be adding their data to our triple store in the near future, as they have large collection descriptions with thousands of component items, so that will be a good test for our stylesheet. Institutions like this have some great archives, and detailed descriptions that lend themselves to strong narratives, linking up people, places, events, to create a whole host of different stories. We are still working on exactly which licence to use for the Archives Hub data, but we are certain that it will be open, as this is vital to ensuring that we can truly connect data. As Edward L Ayers wrote, back in 1999: “Might history, which exists in symbiosis with large amounts of diverse evidence, be especially well-suited for the technology evolving around us?” (from History in Hypertext). I think that the answer is ‘yes’, and I think that Linked Data promises much if it really does become embedded in the Web.